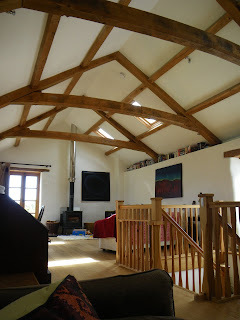 I've just finished a 7 week project in Gulval near Penzance, a 4 bay barn renovation with some interesting features. Stefan Roux designed and drew the frame, Anton Coaker supplied the oak, and I worked with the customer on this one, leading him and a young lad through the framing and raising. Jamie Lovekin and I had worked with him before, building the roof for another barn at his place, the one he now lives in (below). Always nice to get repeat work and see how past projects are settling in, and I look forward to seeing the new project when finished.